I love Board and Batten tag line, "Farm to Skin". Just as it should be, fresh and beautifully refreshing to the skin. Made in beautiful Lake County Florida, the scene of the over 600 acre farm gives a great artistic view of life on the farm, and all of the gorgeous products that come from that work. I loved when we lived on our larger farm, milking goats, making soaps and products. I will never go back to commercial soaps again. It is always a blessing to me to find hardworking farm folks trying to find their niche in the skin care world. Handmade skin care truly is an art. Cover Me, Honey Body Cream comes in a 5oz glass bottle, perfect for sophisticated display! 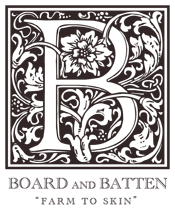 I love the simple elegance of Board and Batten's packaging. The classic black and white really sets off the importance of what is in the product, rather than overdone packaging. The natural essential oil scent to this body cream was very unique. I couldn't quite place just one scent to pinpoint so I asked Patricia, the owner and she said "The scent is an essential oil blend of bergamot, grapefruit, litsea cubeba, geranium, and ylang ylang." I have never smelled anything like it. You can pick out notes of the specific scents, then they all blend together. I really enjoyed the uniqueness! I had never heard of Bamboo Charcoal Soap before Board and Batten and it piqued my interest for sure. This best selling bar utilizes bamboo grow locally on their farm and draws out impurities while it detoxifies. This soap does a great job of lathering, and no the lather isn't a deep black or even gray. After using so many artificially colored soaps in my life, you learn to watch for those type of things. This soap is all natural and contains my very favorite ingredient in a soap.. Goat's milk! There is nothing as moisturizing and lush than goat milk soap in a bar soap! Wished I lived closer to Florida, it would be heavenly to visit the Board and Batten farm! I would love to try the Calming Lift with Hyaluronic Acid. I learned their farm is 200 acres, and now I am jealous ;) I also learned about the the Bamboo Charcoal Skin Tonic. It looks awesome! I'd love to try the Organic Foaming Soap. Sounds nice. I would love to try the Seeds Of Today serum. It sounds like it would work well with my skin. I would like to try the Chamomile and Lavender Bath Salts 4 ounce. I love baths and these salts looks wonderful. I would love to try the detox bamboo charcoal skin tonic! I love trying new skin products! I would love to try their Seeds of Today, it sounds really good for my skin. I'd also like to try the Cleansing and Conditioning Balm as part of my Hygiene routine. I like natural products that don't harm the skin but nurture it. Thanks for sharing the Boardd & Batten Farm products with us. I'd love to try the Organic Foaming Soap.